Palace Street, Graffiti and drop box mystery post box. For those who’ve been following the first 3 short legs of our little central Dublin walking tour, here’s the final short section, complete with pictures of Dublin castle gates, the lovely old 18th century Sick and Indigent Room Keepers Home on Palace Street and a quick look at graffiti but also the new, enigmatic sticker movement sweeping the city. oh and a mysterious orange post box. Enjoy. If you’d rather start at the beginning of the walking tour, please hit here instead. 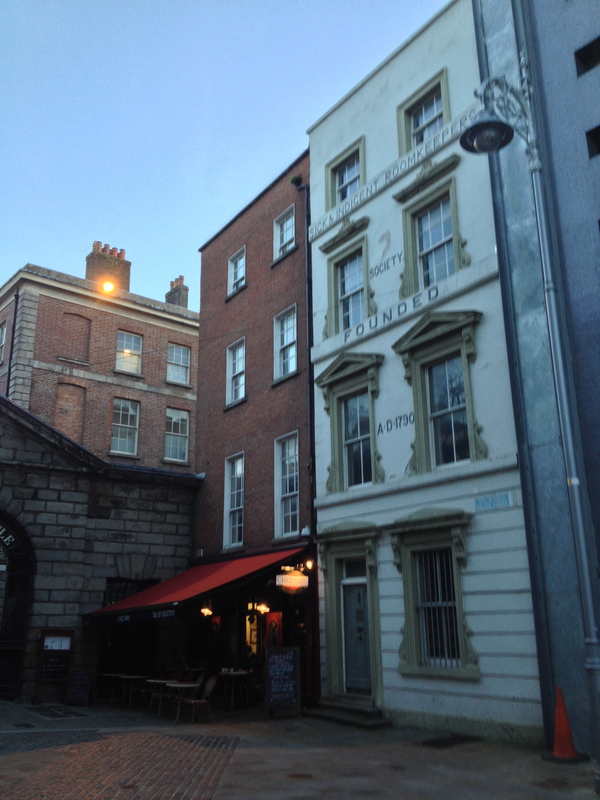 If you would like to book or simply join one of our unique, sociable and highly informative tours, go to Dublin Decoded to see the tour menu and then hit an individual “tile:” to see more information on individual tours and tour dates. If you’re solo, and you’d like notice of scheduled tours, to which all and everyone is welcome, the best strategy is to Like and follow the Dublin Decoded Facebook page where we announce all up-coming walks and tours. and/or follow “Arran Dublin Decode” on Twitter, where we also announce any upcoming walks and tours. Thanks for the walk Arran. As one who has diced with the traffic on College Green I wonder if pedestrianisation would work? It can work brilliantly (Grafton Street) but elsewhere it has simply killed town centres and encouraged out-of-town shopping. I’d be interested to read your proposals. Thanks Roy, and you make an excellent point about pedestrianization, as you say, it can indeed do more harm than good. I’m a big believer in its not what you do but the way that you do it. So the details and “how” of any such scheme are vital. Have been planning a post for some time with a list of ideas for how we could radically improve Dublin city centre, return to to, and reveal, its genuine beauty. Hope to post on that soon. thanks as always for your perceptive comments, the support is greatly appreciated. Next Post Neon Art, Three act structure and seriously, Why Go Bald?